GREAT MILES 37,687! REDUCED FROM $29,995!, PRICED TO MOVE $1,200 below NADA Retail! Heated Leather Seats, Moonroof, Nav System, Supercharged, All Wheel Drive, Aluminum Wheels, COLD WEATHER PACKAGE, REAR SIDE AIRBAGS CLICK ME! 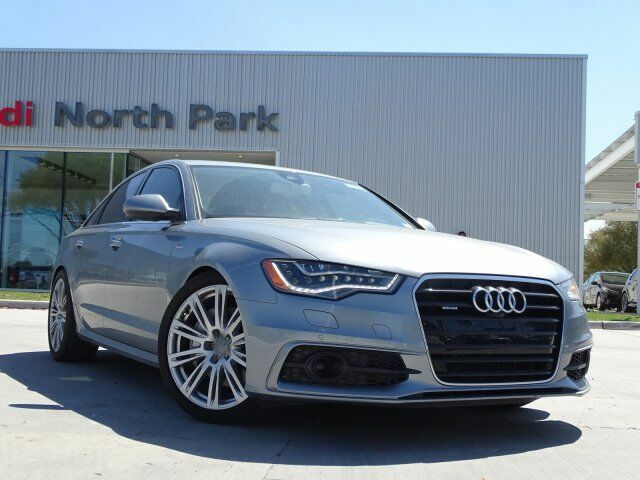 Leather Seats, Navigation, Supercharged Audi 3.0T Prestige with Quartz Gray metallic exterior and Velvet Beige interior features a V6 Cylinder Engine with 310 HP at 5500 RPM*. PRESTIGE PACKAGE Power Adjustable Steering Column w/Memory, Head Up Display, LED Interior Lighting, Power Rear Window & Rear Side Window Sunshades, 4-Zone Climate Control, Front Seat Ventilation, DRIVER ASSISTANCE PACKAGE Audi Active Lane Assist, Adaptive Cruise Control w/Stop & Go Functionality, Audi Pre Sense Plus, Top View Camera System, COLD WEATHER PACKAGE Heated Rear Seats, Heated Steering Wheel, REAR SIDE AIRBAGS, AUDI PROTECTION GROUP Audi Guard All-Weather Floor Mats (Set of 4) Black rubber mats w/A6 logo, Audi Guard Cargo Mat, durable trunk liner w/A6 logo. MP3 Player, Sunroof, All Wheel Drive, Aluminum Wheels, Keyless Entry, Remote Trunk Release, Child Safety Locks. Was $29,995. This A6 is priced $1,200 below NADA Retail.